Come join a group of Haskell hackers to work on a wide variety of projects. All levels welcome. Special thanks to IMVU, Google, Aleph Cloud and Twitter for sponsoring BayHac '14! Haskell Platform, the new build - We are working on a new build system for all of Haskell Platform: Generating tarballs, installers, and even the web site from one single Shake based build tool. Lots to do! See Mark Lentczner. lambda-ccc - a project for compiling Haskell to hardware. I'm doing this work for my day job, but the development is open, and the result will be shared freely. The project starts with a GHC plugin that transforms Core in order to generate a convenient-to-manipulate GADT representation of the original. Then convert to an Arrow-like algebraic interface that can be interpreted in various ways, including as circuits. See Conal Elliott. Snowdrift.coop — a community-engagement and fundraising platform strictly for Free/Libre/Open projects, built on Yesod; Head developer David Thomas and co-founder (and Haskell beginner) Aaron Wolf will be on hand. We have a wide range of projects at different levels and sizes to hack on. 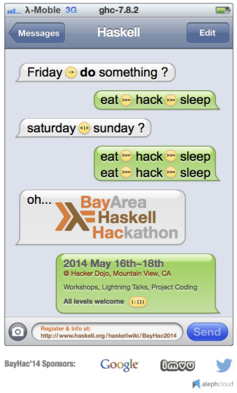 We'll be hanging out on #bayhac on FreeNode. This page was last modified on 13 June 2014, at 17:52.